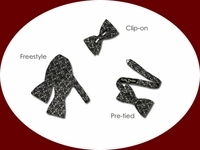 Permanently knotted bow with an adjustable neckband that fits neck sizes from 14" to 22". There is a discreet hook and eye closure behind the bow. 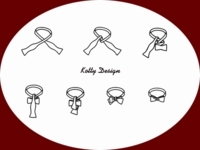 WIDTH: Our standard bow width (high) is 2.5" for all styles. This classic bow width is always a good choice and is preferred by a majority of our customers. Large 3.5" width (high) - Custom. This large bow looks best on tall men with larger neck sizes. Slim 1.5" width (high) - Custom. This is a good choice for men with small collar sizes. 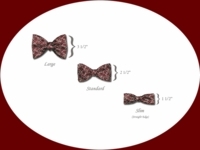 Slim width bow is the best for small patterns and solid colors. All custom ( made to order ) items are not returnable. Custom order takes more time to be made.